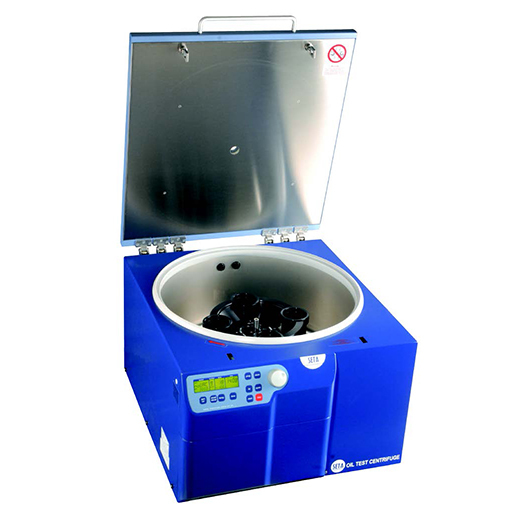 Seta Oil Test Centrifuge – 4 place, 90000-3 | Lazar Scientific, Inc. Speed, temperature, and timing are microprocessor controlled and run parameters are entered via the panel controls and digital displays. Speed can be specified and measured in either RPM (rotational speed) or RCF (relative centrifugal force) mode and 99 run profiles can be stored in memory. The run duration can be set between 10 seconds and 100 hours in one-minute increments, or set for continuous operation. Acceleration and braking time are user adjustable. A controlled isothermal band heater holds the sample temperature between 30 and 80°C ±2°C, and is programmed to compensate for friction heating effects during operation thus ensuring correct sample temperatures throughout the test. A brushless asynchronous motor ensures high reliability with low maintenance and the centrifuge has in-built error messaging diagnostics. SAFETY features include a motor driven lid latch with a safety interlock to prevent centrifuge operation while the lid is unlocked, imbalance detection, and over-temperature protection for both the motor and the chamber. The centrifuge is almost silent in operation with measured noise levels below 55 dB (A). Two types of trolleys are available as optional accessories to allow easy movement of the instrument. The centrifuge meets the safety requirements of BS 4402; DIN 58970; IEC 1010-1; IEC 1010-2-D; pr EN 61 010-1 & 61 010-1; BGR 500; Chapter 2.11; Part 3; UVV VBG4; and VDE 0871. Supplied with: rotor, buckets and cushions.